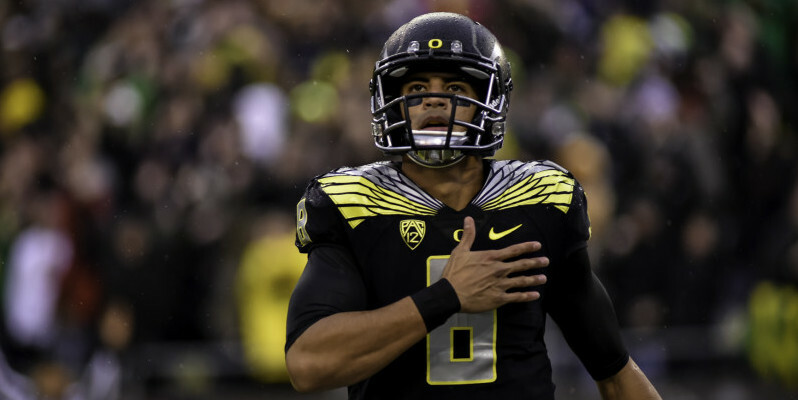 Marcus Mariota is the greatest Oregon quarterback to play at the school. That is a well-accepted statement around Eugene these days. But with Mariota headed for the NFL, it’s about time to remember some other Oregon quarterbacks who have made it to the big stage. Joey Harrington will always be a fan favorite in Eugene. Mariota has a chance to be the highest Duck drafted in the Common Era if he goes either No. 1 or No. 2 on April 30 in Chicago. Two other Oregon signal callers have been drafted third overall, and defensive end Dion Jordan was also the third overall pick in 2013. The most recent Duck quarterback to be drafted in the first round was Joey Harrington in 2002. Harrington had a stellar career in the green and yellow; he led the Ducks to a Fiesta Bowl victory in his last game under center. He became the first Oregon player to become a Heisman finalist, and finished his career with a 25-3 record before being selected No. 3 in the draft. The success didn’t translate to the NFL, however. While Harrington played for a horrendous Detroit Lions team (I’m a Lions fan and trust me, that team was terrible), he threw far too many interceptions to be a consistent NFL quarterback. He wrapped up his career in New Orleans in 2008, before making the eventual jump to broadcasting. If Harrington was Oregon’s latest “bust” at quarterback in the NFL, he certainly wasn’t the first. Akili Smith was the selected by the Cincinnati Bengals in 1999 with the No. 3 overall pick, even though he had only 11 starts in college. Smith played in three seasons, and threw only five touchdown passes in his career before calling it quits. Unfortunately, he is considered one of the biggest quarterback busts of all time. Dan Fouts under center for Oregon. There are successful Duck quarterbacks who have played in the NFL, however. You just have to go back in history to find them. Dan Fouts, who played at Oregon from 1970-72, played for the San Diego Chargers for 15 seasons. Fouts was a six-time Pro Bowl selection, led the NFL in passing yards from 1979-1982, set the NFL record for passing yards with 4,802 in 1981, and finished his career with 43,040 yards passing. Although he never made it to a Super Bowl, Fouts was one of the best quarterbacks in the league when he played. He was elected to the Pro Football Hall of Fame in 1993. 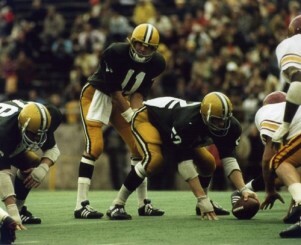 Fouts isn’t the only Duck quarterback in the Pro Football Hall of Fame. Norm Van Brocklin played at Oregon in the late 1940s, before being drafted by the Los Angeles Rams in the 1949 NFL draft. He spent eight years with the Rams, winning an NFL championship in 1951 and set an NFL record for passing yards in a single game that same year. Van Brocklin’s record of 554 yards still stands, more than 60 years later. He wrapped up his career with the Philadelphia Eagles in 1960, where he won another NFL championship against the Green Bay Packers — becoming the only quarterback to ever beat Vince Lombardi in the finale. Van Brocklin was elected to the Hall of Fame in 1971. There are other Duck quarterbacks who have played in the NFL, Chris Miller, Kellen Clemens, AJ Feely, Dennis Dixon, George Shaw and Bill Musgrave, but none with more notoriety than the four mentioned above. 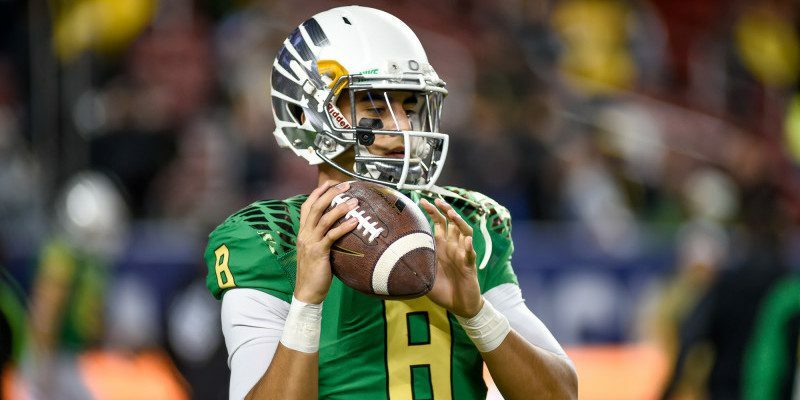 Oregon has two top-5 draft busts and two quarterbacks end up in the hall of fame, so which route will Mariota take? Duck fans will watch his NFL career with great intrigue to find out.